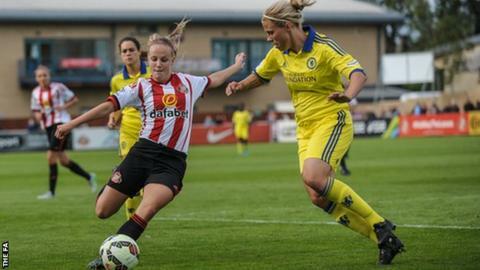 Sunderland Ladies striker Beth Mead deserves a senior England call-up, says Black Cats boss Carlton Fairweather. The 20-year-old scored a hat-trick against leaders Chelsea in a 4-0 win to take her tally for the season to eight and make her the top goal scorer in Women's Super League One. "Shouldn't be long," Fairweather told BBC Sport. "She's the top goal scorer so that in itself should hopefully get her the call-up that she probably deserves." He added: "She's done really well. She works really hard in training and deserves the accolades she's getting at the moment,"
Mead's hat-trick, which came two days after a car crash, inflicted a first defeat of the season on Chelsea. She has represented England from the under-15s through to the under-23s but is yet to be contacted by manger Mark Sampson. "I'll keep my fingers crossed," she told BBC Sport. "I'll keep trying to play my best and hopefully it will come eventually." Following their recent third-place finish at the Women's World Cup, England begin their qualifying campaign for the 2017 European Championship with an away fixture against Estonia on 21 September.